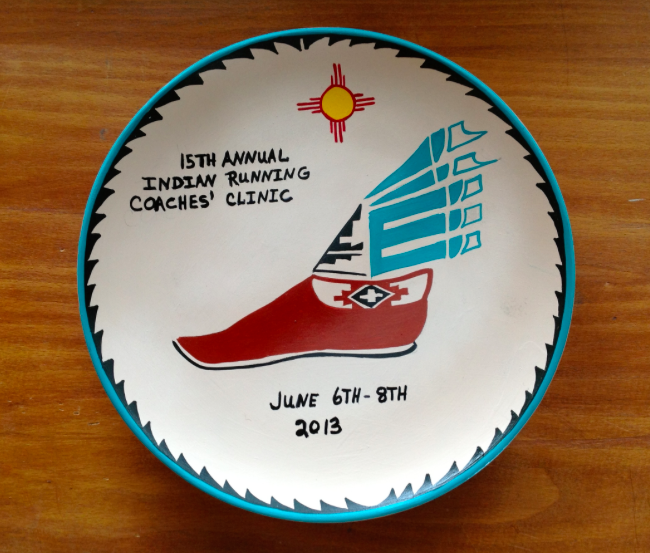 In June I had a great opportunity to speak at the Wings of America organization’s annual American Indian Running Coaches’ Clinic in Albuquerque, New Mexico. I spoke to a group of nearly 50 Native high school runners, and a number of coaches, including Hopi coach Rick Baker. I don’t often get a chance to speak to such a well-informed audience! Other presenters included Navajo scholar Lloyd Lee, Anthropologist Peter Nabakov, who once published a remarkable book entitled Indian Running, Jemez Pueblo runner Steve Gachupin, and many others. Although I was not able to listen to Steve Gachupin’s talk, I have great respect for him as a runner. Known for winning six consecutive Pikes Peak Marathons in the late 1960s and early 1970s, he is a strong advocate for running among Native youth. I first learned about Gachupin and his running accomplishments from an excellent article by historian Brian S. Collier entitled “’To Bring Honor to My Village’: Steve Gachupin and the Community of Jemez Running and the Pikes Peak Marathon” (Journal of the West, Fall 2007). If you are at all interested in running, be sure to read this article (it’s an article that I often cite in my work). I should also note that the beautiful plate above was given to everyone who presented at the Clinic. It was made by Jemez Pueblo potter Bernice Gachupin, Steve Gachupin’s wife. Finally, I want to give a special thanks to Wings of America Program Director Dustin Quinn Martin and other organizers for their hard work in making this terrific event possible.